Blog Theology: Do We Dislike it or Do We Fear It? 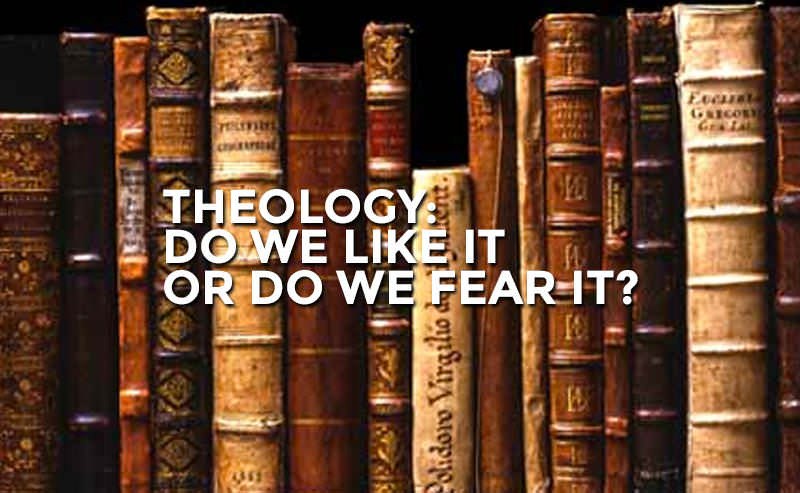 Theology: Do We Dislike it or Do We Fear It? Theology is the study of the nature of God. How anyone can study God and not be changed in the process is beyond me. It is a tragedy that ‘theology of God’ and ‘relationship with God’ have been so drastically separated. I often think of a human relationship in order to try to understand this senseless separation. Imagine a dating relationship where the girl eagerly desires to spend time with the guy, but has no desire to actually get to know him. She thoroughly enjoys going out on dates with him, watching movies while holding his hand, and laughing together as they flirt back and forth. However, any time the guy opens his mouth to tell her anything of substance about who he truly is she tunes him out by saying she’d rather just spend time together. When he attempts to tell her about his family and his childhood she’d rather just make-out. When he attempts to tell her about his passions, hopes, and dreams she’d rather just pop in another movie and cuddle. I think many Christians treat God in this way. They talk about how incredible their “relationship” with God is and how much they enjoy spending time with him, but they know very little about who he actually is. Their “love” of God has not driven them to search out his character and nature. I’m personally not even sure if you can call this love. There are so many Christians my age who love worshiping God through music or going to a group where everyone can share their opinion about who God is without ever being held accountable to doing any actual research. Far too many of us believe that God is abstract and subjective. That the beauty of God is in the eye of the beholder. This is simply not true. There are endless attributes of God that exist whether you see them or not. The nature of God is very objective, not subjective. How can God be subjective and yet tell us he ‘never changes’? Theology is vital for Christianity to continue. However, I can see where the lack of appeal may have come in. Somewhere along the line theology got a rap of being a solely scientific (cognitive) discipline. But Christian doctrine is meant to serve the goal of moral transformation and developing moral excellence (among many other things). I believe it is of the utmost importance for us to find a place for theology in the process of character formation. Theologically, we must come to understand that God is good for us, and therefore, the life to which he calls us is good for us as well. To me this is the theological concept of Christian Hedonism, which when understood should cause us to live lives according to God’s will. Even for John Calvin, the purpose of theology was to enhance godliness and not merely speculate about the eternity of God. We do not have to be rationalists in order to appreciate theology. We recognize that not everything can be known about God in this life and yet still acknowledge that there is much that can be known. The ‘mystery of God’ must not be used as an excuse for theological apathy. Theology is an invitation to seek God wherein we find certainty. It is not a quest for certainty, it is a quest to know God in order to know ourselves and who we should be. If we learn to recognize theology in this way and begin to teach it in this light, I believe many will no longer be so repulsed by it. However, this will require those who are theologically inclined to begin to view themselves as pastors whose chief goal is to help people ‘find their identity in God’.